WELCOME TO THE WOOD CARVERS SUPPLY, INC ON-LINE STORE! Wood Carvers Supply Inc is the original US Company solely dedicated to meeting the needs of wood carvers for tools and supplies worldwide. 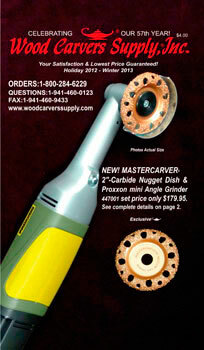 Wood Carvers Supply Inc was founded in 1955 by a European master wood carver. Today we continue to lead our industry with top quality, innovative products, service and value. Many of our products are developed by and available only from us; all are guaranteed for satisfaction and lowest price. Our shipping charges are fair and simple. Just $8.50 covers the cost of delivery within the 48 contiguous states regardless of weight or value! To maintain our low prices we sell direct to you, our customers by mail, fax, catalog and the Internet. If you would like to speak to someone about placing an order or requesting our 68-page free color catalog, call 1-800-284-6229. We have live customer service representatives on duty answering our toll free number 24 hours, every day of the year! If you are not completely satisfied with any item purchased from Wood Carvers Supply, Inc. simply return it in new condition within 30-days with a copy of your invoice & we will cheerfully repair, replace, credit or refund purchase price of item, whichever you prefer. Regrettably, we cannot accept returns for videos / DVDs except replacement due to defect. In the unlikely event, that you find an identical item purchased from Wood Carvers Supply, Inc. in another nationally distributed catalog or website for less, send proof within 30-days with item marked & your invoice & we will credit the price difference. Except discontinued & below cost items.